LANGLEY,BC–Over 4000 screaming fans at the Langley Events Centre were treated to a battle between the two top teams in BC high school basketball, Saturday night. It wasn’t the prettiest game, and both teams were likely fatigued from a compressed tournament schedule that saw them play four games in four nights, but in the end the Walnut Grove Gators were able to outlast the White Rock Christian Academy Warriors 59-53. As it has been all season, the Walnut Grove bench was key. Senior guard Brad Hoffman was the second leading scorer with 11 points in 19 minutes, and forward David Wolde-Mariam caused havoc all over the court, contesting shots and battling for rebounds. He finished with 5 points and 7 rebounds in 18 minutes. For White Rock Christian, 2013 guard Tyus Allen led the team in points (14), rebounds (12) and assists (5). Forwards Vartan Tanielian, Peter Spangehl, and Sam Ykema also finished with double digits in scoring, but as a whole the Warriors shot the ball poorly, especially from deep finishing, 7/32 from beyond the arc. The Warriors now go about the task of rebuilding a program that has been strong for over a decade. 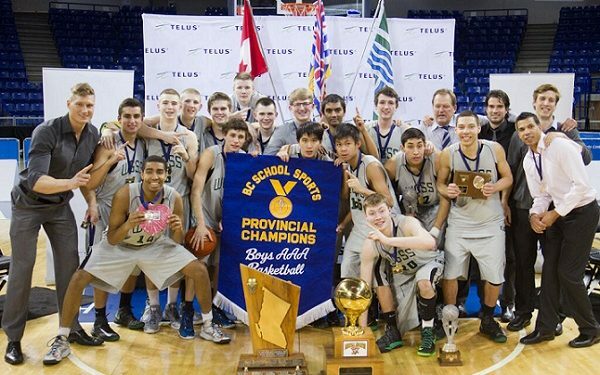 We may not hear from White Rock basketball for some time, but if Scott Allen has any say, the program that he built won’t be down for long. Sunny Ahluwalia is a British Columbia NPH correspondent, covering all levels of basketball in the province & promoting the game in Western Canada. British Columbia’s Rising Talent Shines at NPH Showcase!